But Katie never expected her ex-boyfriend, widower Sam, and his two adorable children, to turn up on her doorstep. She didn’t think that any man could tempt her under the mistletoe this year, but Sam might just prove the exception! And as the snow begins to fall and Katie puts the final touches to her famous Christmas cake, she begins to wonder, could her Christmas wish actually come true? I loved the characters, and the dialogue between Katie and Sam, they fit together perfectly and you just want them to find their perfect ending. 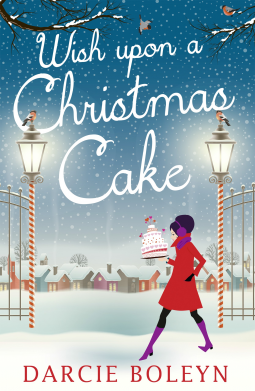 Don’t get me wrong not everything in Katie’s life is perfect, she has a difficult relationship with her mother which is apparent throughout wish upon a Christmas Cake, also Katie’s grief at loosing her grandmother all help to make the story more credible and not just a fluffy Christmas read, and I think that’s why I loved it so much. This entry was posted in Darcie Boleyn on October 5, 2015 by lollyrugs.